Krow Fischer, Wendy Murdoch and The Council of Elders bringing insight and understandings for every day life. The Council of Elders are a non-physical group of advisers who broadcast through Deep Trance Channel Krow Fischer. Their deep wisdom and practical advice make advanced topics easy to understand. The unique perspectives offered create a series of 'aha' moments that are life changing in their application. Check out our Private Podcast section, a 'spiritual intensive' covering monthly topics that you can listen to right here on Blogtalk Radio. Get your private link at our website. www.hereonearth.ca Conversations with Red and the Council of Elders CD/MP3 Teaching Series has the most advanced spiritual understandings you can access on the planet today. Check out over 60 topics that will enlighten and awaken your curiosity about life, and beyond, www.hereonearth.ca Weavers of Light.. A Channelled Book of Wisdom for our Changing Times, a practical manual for conscious living is also available from our website. 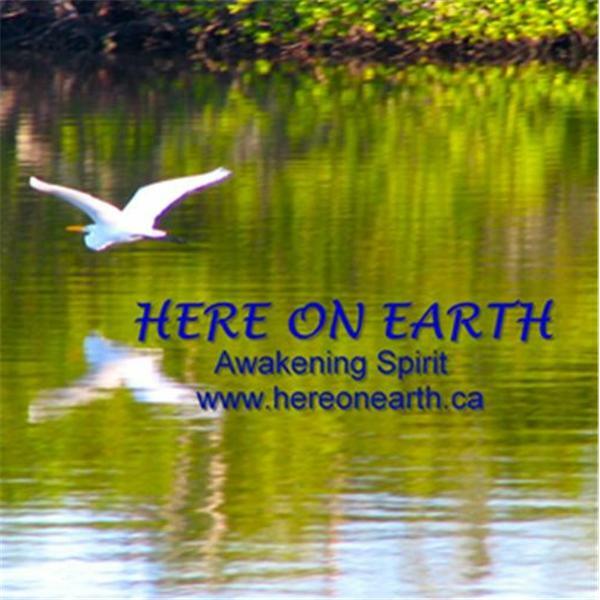 Check us out at www.hereonearth.ca and see what else we have to offer you on your journey of awakening your spirit. Life After Life and What Happens In Between! Life after Life and what happens in-between Exploring Past Lives with The Council of Elders Have you met people that you seem to know right away? Have you been somewhere that you 'remember' from before? Do you have weird phobias that you don't understand the source of? Are you fascinated with specific time periods or cultures? Join us live with deep trance channel Krow Fischer as she brings in 'Red' from The Council of Elders to answer YOUR questions on this interesting topic. Krow has been a channel for the Council's teachings for almost three decades. Conversations with Red & The Council of Elders, recorded monthly teachings on over sixty topics are available as CD or MP3. The channelled book, WEAVERS OF LIGHT, A Book of Knowledge for our Changing Times as well as some transcriptions and plenty of things to watch, listen to and read, can be found on our website at www.hereonearth.ca Donations to keep our Radio Sessions free are gratefully accepted there as well! Join us live Call in with your questions and we will see what The Council has to say. Part 1: Health and Wellbeing, Cancer and Colonization, the patterns of illness. This and That, Odd Questions, Wierd Ideas, A Time To Talk to Spirit! CALL IN!